McCarthy suffered a serious injury when took a line drive off the side of his head during a game in 2012 when he was with the A's. Arizona Diamondbacks pitcher Brandon McCarthy joined "The Buzz" podcast Wednesday and said there’s a chance that MLB pitchers could have the option of wearing special protective headgear as early as the 2014 season. He said the headgear would look like a hat but would be able to protect a pitcher from serious injury. "They’re coming," McCarthy said of the headgear. "From everything I know they’ll be available this year. I don’t believe they’re going to be mandatory. Actually, I’m almost certain they won’t be mandatory. "I did get a chance to sit down with the head MLB doctor last year during spring training, who’s overseeing the whole thing, and it has been a high priority for them. It’s just that there has been very few answers. We both agreed on it not being mandatory at the time, there’s just no need to do that. But whatever gets proposed has to be correct or we’re not really doing too much." When reached for comment on this possibility, an MLB spokesperson said, "One product that has passed the testing standards should be available to players for next season. We are still evaluating a number of other potential products. Our conversations with the MLBPA are ongoing. We expect this issue to continue to evolve, but we believe this is an important first step." 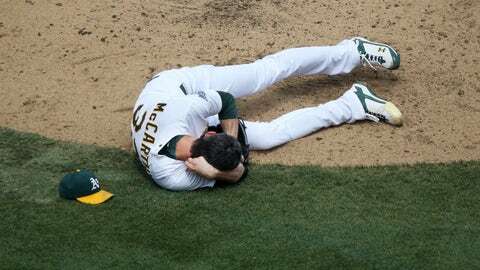 McCarthy, as you might remember, suffered a serious injury when took a line drive off the side of his head during a game in 2012 when he was with the A’s. He said the new headgear that he’s working on with a company would have prevented that injury. "It should be strong enough and capable enough that literally if I got hit by the same exact ball I would have been able to keep pitching in that game," McCarthy said. The only problem with the headgear? How it looks. "It looks ridiculous and we get so used to the way things look," said McCarthy, who recently took a picture of himself with the headgear on and sent it to other pitchers in the league. "You mentioned the new football helmets and batting helmets, everything looks silly until it doesn’t look silly anymore."